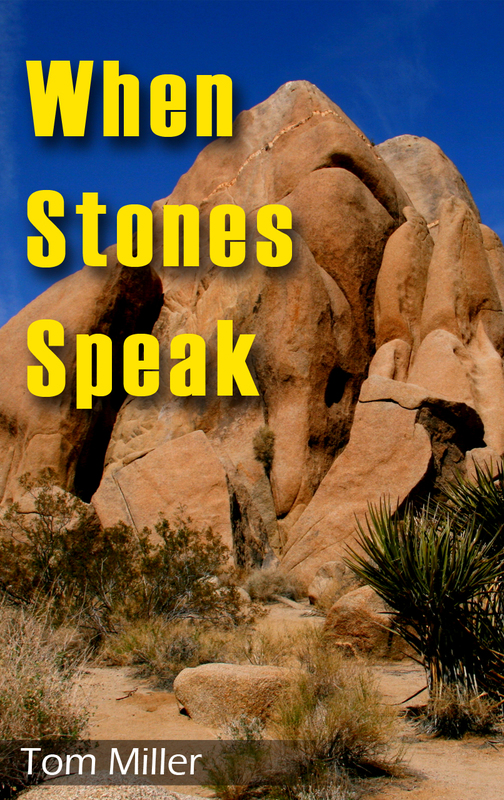 I’m almost embarrassed to write this installment. 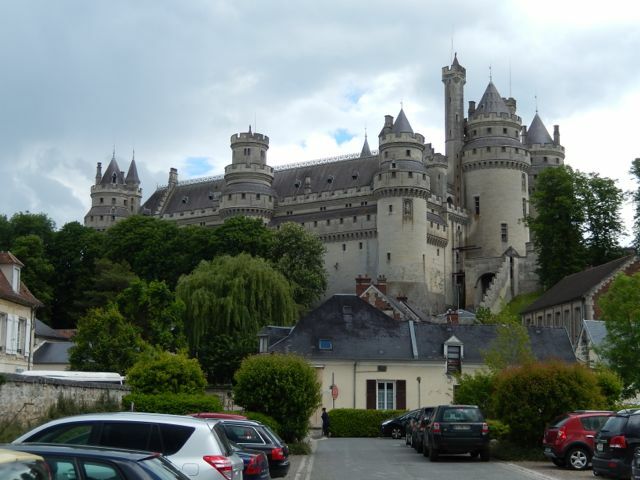 It wasn’t that long ago that I wrote about Lisa’s favorite chateau, Chateau Pierrefonds and the Armistice clearing just outside of Compiegne. We decide to give our friends Tess and Bruce a treat and show them these two very special historical sites. We had to rent a car because we no longer have Wilco’s. We will change that situation shortly and buy a car, but that’s a story for another day. We jumped in our rental car and headed south towards Compiegne. Unfortunately the rental company didn’t have a GPS and the map they gave us was for all of France. We couldn’t figure out which off-ramp to take and ended up going past our turnoff. 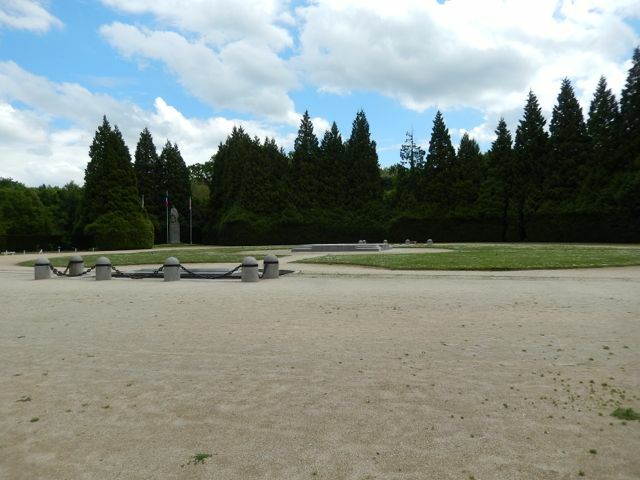 Eventually we found the Armistice site, and it hadn’t changed a bit from when we were there 12 years ago. In fact based on the pictures they have in the little museum the site hasn’t changed much in the last 100 years. The following picture is of the exact spot where the armistice that ended the greatest war in history was signed on November 11, 1918. 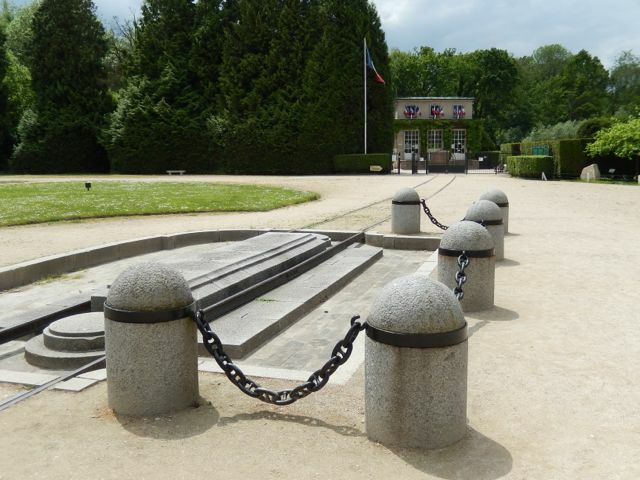 Marshal Foch’s mobile headquarters was brought to this site in the middle of the Compiegne Forrest. The trees were so thick aerial observations were impossible. 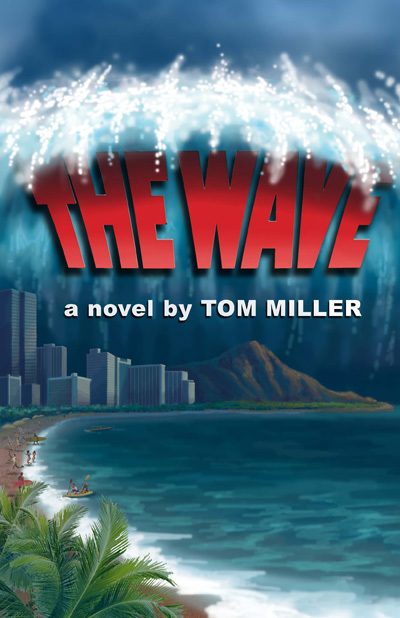 The Germans arrived in a rail car on a different track less than a hundred yards away. When the war was over a small museum was built to house Marshal Foch’s rail car in the same spot where the current museum exists. 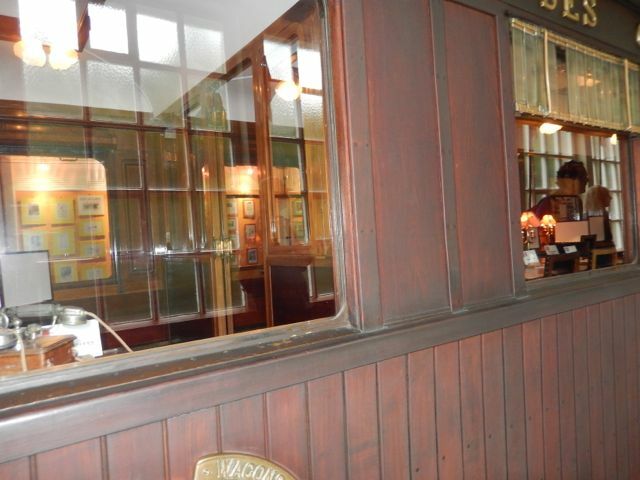 In the first picture you can see the museum that houses a replica of Foch’s rail car. The spot where the 1918 and 1940 armistices were signed. In the foreground is the spot where Foch’s rail car was, and close to the trees in the background was where the German rail car was. 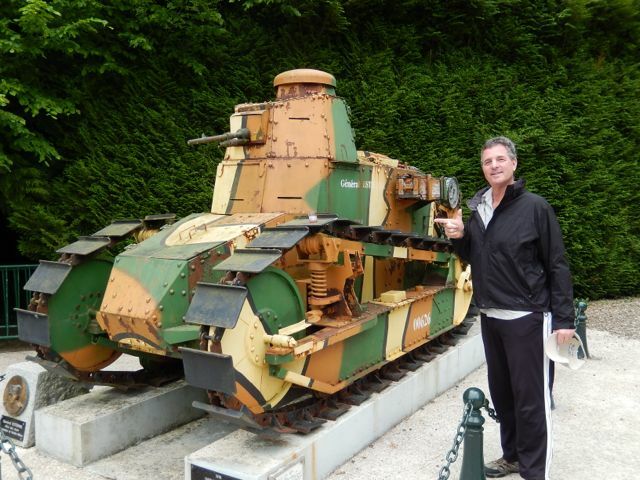 A WWI tank doesn’t look very threatening. 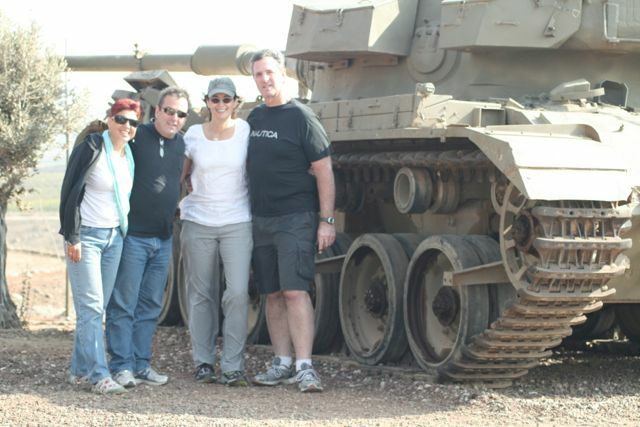 An Israeli tank can do some damage. 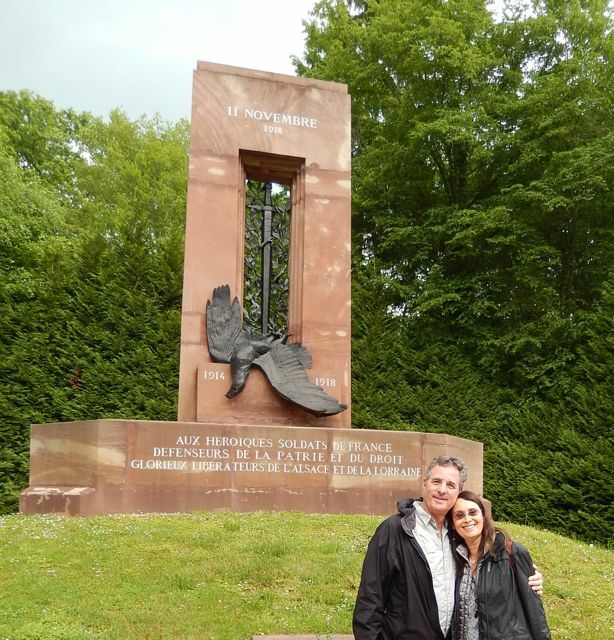 On June 22, 1940 the armistice ending the Campaign of France was signed on the exact same site. Hitler had Foch’s rail car brought out of the museum, and placed directly over the granite marker between the rail tracks in the first picture. There are pictures in the museum of Hitler stepping into the rail car. When you look at the first picture the entrance to the rail car would have been directly to my left. I was standing in the same spot that Hitler was on June 22, 1940 as he stepped onto the rail car to sign the armistice. The creep factor went off the scale knowing what had happened there almost 75 years ago. Looking inside Foch’s rail car even though no pictures were allowed. This statue of the fallen German eagle was covered in Nazi flags at the signing of the 1940 armistice. Chateau de Pierrefonds stands over the village of Pierrefonds. It is a magnificent structure in a fantastic setting. We loved the collection of sculptures done by the same factory that shaped the Statute of Liberty. The Great Hall was impressive and in reasonably good condition. The chateau had been left in ruins until Napoleon III came along and refurbished it, which is why the castle looks as good as it does. Lisa sill wanted me to buy it for her, and I would have considered her request had I been able to pay the 3,000 francs that Napoleon did, and I didn’t have to pay the heating bill. Chateau Pierrefonds stands guard over the village of Pierrefonds.